It's taken me a while to get around to trying a few fragrances from Biehl Parfumkustwerke; not from a lack of interest, but just because they're not widely distributed and because, well, they don't have actual titles that capture my imagination and stick in my memory. I realize that Biehl's naming-numbering system is very deliberate — as the company website proclaims, "even the names of the individual works are not puffed up by a seemingly sensual play of words but simply bear the initials of their artist and a consecutive work number." All the same, I can't help feeling like it's homework for me to remember which is which. In any case, random grumbles aside, I've recently tried PC01, which is perfumer Patricia Choux's first contribution to the collection. It's described by the phrases "sun, finally. a breath of wind. the soul smiles" (all lower-case) and its composition includes top notes of tangerine, neroli, davana, and mango leaves; a heart of peony, iris and mango; and a base of kaschmir [sic] wood, vetiver and musk. I thought this fragrance would be a good follow-up to my recent review of Rosie Jane Tilly, which was another fruity-floral with a summery theme (and a silly name, but that's beside the point). Even more specifically than summer, PC01 feels like a vacation to warmer climate, especially the moment when you first step out of the airport and you're hit with heat and light. It's a bold and sophisticated mélange of tropical fruit, with a generous accompaniment of green notes and a few quieter florals in the background. It strikes a nice balance between sweet and tart: the tangerine note smells properly juicy, and the mango is just slightly under-ripe. I've read that Choux has worked for Jo Malone and was one of the noses behind Marc Jacobs's Orange Splash cologne; if that's all accurate, it makes sense, because PC01 is not an abstract fragrance — like the Jo Malone line, it smells like "real," specific things. On the other hand, it's more vivid (and longer-lasting) than most of the Jo Malone fragrances or the citrusy Marc Jacobs Orange. Its peony is a soft counterpoint to the lively fruits, but PC01 does stay brightly colored for most of its evolution on the skin. The dry down brings out some of the sheer musk and woods. PC01 isn't something that I'd buy as a full bottle, simply because it's not really "me," but if you love summery fruit fragrances made from good quality ingredients, you should by all means give PC01 a try. It could easily be worn by men as well as women. Biehl Parfumkunstwerke PC01 is available as 100 ml Eau de Parfum ($195). 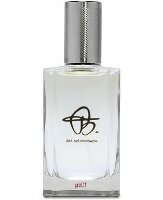 For purchasing information, see the listing for Biehl Parfumkunstwerke under Perfume Houses. 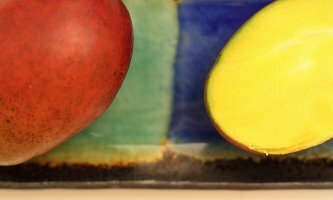 Note: top image is 62:365 Mango [cropped] by Jin Choi at flickr; some rights reserved. I have mixed feeling about Biehl pc01, there’s something I like and disline in this fragrance. But the newest one, gs03 is really, really bad. It reeks of pure Iso E Super on my skin. I’m a little mixed about this one, but probably just because it’s more fruity than the fragrances I usually wear. I haven’t tried that GS fragrance yet — although I think I might have a sample. PC01 is one of my summer perfumes. I don’t smell fruit at all — it seems quite grassy to me, with maybe a hint of sand dunes. Really? That’s interesting. It’s so very fruity to me! I wonder why. It’s true, I’ve just never been able to get interested in this line even though I actually have samples. I tried some of them – but which ones??? Who can remember? I’d have to take notes. And later be able to find my notes. The prices don’t help, either. Ah, I know! Same here, for all of that. Price and lack of availability mean that I probably won’t get to try this, and nor am I attracted to the arty-ness of the line. But I do know what you mean about that feeling of travel to a warmer place, and the sudden heat and light. That is such an uplifting experience. Le Labo’s Lys 41 has a joyful summery feel to me but it does not have a fruit element. Say what you like about fruit in perfume, it has its place, no doubt about it. It’s great to own a fragrance that feels this way — and the connotation is different for every person, of course! I have not tryed PC01 but i think i may now. I loved GS03, it reminded me of christmas. Mainly because of the balsam. I enjoy a fruity floral as long as it’s not to sweet. Example being Petite cheri which i grew to love this summer but hated at first. It did lack some debth but for summer and all the heat,who needs all that complexity. I agree — best to keep things light and simple during a heat wave! I’ll be trying a few other scents from this line, so maybe I’ll have more reactions to share. I’m a sucker for a good name. Or even just a name. If someone asks what I’m wearing it just sounds so much nicer to say “It’s called Evening in Paris” as opposed to “It’s PC01.” When I see letters and numbers like that I immediately joke to myself that the flanker might be WD-40. I don’t mind using just numbers for the name though, like the Chanel’s. It’s not a deal breaker if I really love how it smells though. I’m such a word person, as well as smell person, that I always fall for an evocative name, too — at least enough to try the fragrance once! On the other hand, By Kilian has names for all its scents, but I can still never remember which is which. Too many fragrances in each collection? Too much similarity between the names? Who knows! Well, it seems a lot of their names include “Love.” And most of them are so over-the-top it’s embarrassing, so I refuse to remember them. I know this is really shallow ; but the names were such a turn off that I’ve never had the slightest interest in exploring the line. I feel better now… I’m not alone!! You’re not alone, either of you – I only started sampling them because I was in Osswald, which stocks them. I really like shopping at Osswald! I zone out when a fragrance does not have a name. I just won a sample of gs03 and didn’t even remember entering the contest. I am certain this is the reason. And, I prefer a real name too; something that actually means something. Not these run-ons that sound like pedigreed dogs or race horses. Rant over. I liked, not loved, gs03, but got quite a few complements on it. For me, it fell into that 4711 category. Clean cologne, and I can stick with the gallon I have. There are quite a few upscale colognes on the market these days, aren’t there? I’m just discovering this line too, and I find the lack of memorable names really hampering. There are a couple I’ve liked fairly well; I couldn’t tell you what they were for the life of me (without going back and reading my notes about them). I think these names avoid the potential marketing pitfalls of other types of signifiers but they really DO NOT stick in the head. I can understand the concept… letting the “juice” stand on its own merits… but it’s a large-ish line, and I’m familiar with all the perfumers, so I’m still figuring it out! So happy to read that I’m not alone in being influenced by names! Numbers just don’t cut it for me, not even for lipsticks. For ex I never got around buying Shiseido’s Perfect Rouge, despite the good reviews, because I can’t feel emotionally connected to a number. With that said, I actually saw this line today at a department store and didn’t feel drawn to smell any of them. The bottles all looked identical, you could only see the names (numbers…) after close inspection, they are written in such a small font size. Doesn’t seem like a good marketing technique to me, to make the product look so boring and non- eyecatching. Wonder how they are doing saleswise. All I can guess is that some niche-perfume customers like this kind of challenge, lol! Well, they’ll beat me at the memory game when it comes to MB02 versus GS01, etc.